I used up some scrap paper I had and used one of my new embossing folders and then distressed with some white ink. The black silk ribbon and metal charm I've had forever and the glittery black brads I forgot I even had. I was looking for my chipboard letter "U" to make an adore U card, but couldn't find it. I will add that later when I have better access to my stuff! 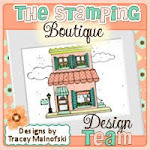 I hope you play along with us this week/month, we have our regular monthly sponsor Stamp & Create sponsoring us for the month of May. 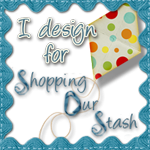 If you haven't checked out your shop you definitely should as they alway have fantastic sales many new items coming in regularly. Did you know they even have the latest Magnolia collection "Summer Memories" ready to ship? We have a long weekend here in Canada this weekend & boy have I been looking forward to our weekend away at the cabin. Hope you have a fabulous week this week too! 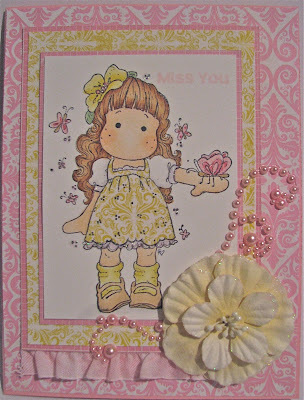 For my card I decided to use the diagonal line (Yellow, Pearls, Ribbon & Pink). 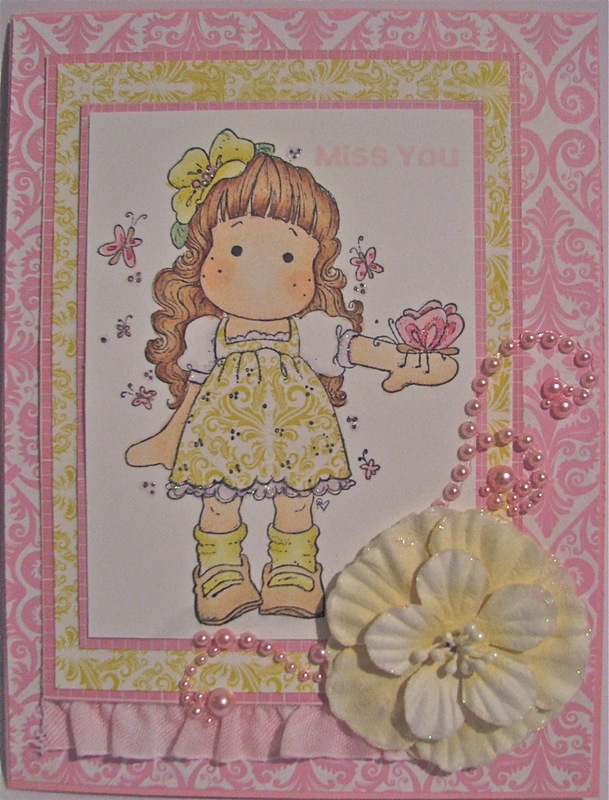 For my Free I chose to use glitter on the trim of Tilda's dress, the butterflies & the gorgeous yellow flower. I had so much fun colouring this Magnolia image "Tilda with Hawaiian Flower" with my copics. I really wanted to paper piece her dress and I love how it turned out. I used scraps left over from my Echo Park "Victoria Gardens" paper pad. 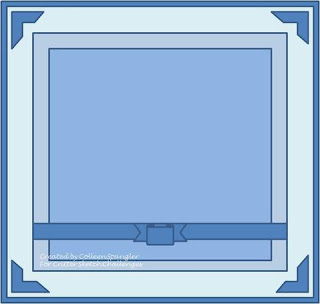 I used this scrap of white ruffled ribbon & airbrushed it with my copic markers to match. I'm sending this card off to my little sister in Edmonton who I don't see as often as I would like. 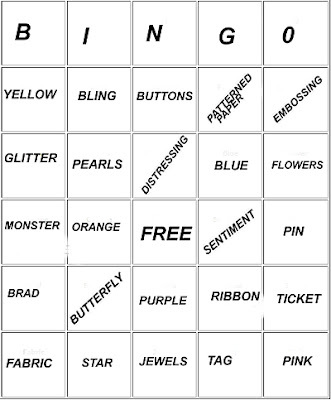 In order to be eligible for my blog candy you need to create something using our Bingo card in our 2 week challenge and link it up to the SOS Challenge Blog and then come back here and leave a comment letting me know your entry #. You can enter as many times as you would like but don't forget to comment each time so I know how many times you've entered. 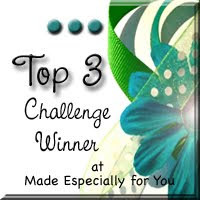 SOS Challenge #51 - Get out those scraps! The little green scallops under the pink paper is some cute green ribbon that I had in my stash. 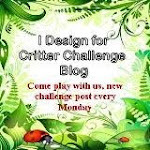 I hope you will play along with us this week over at Critter Sketch! Did you know we are having a DT call? Check out all the details here! 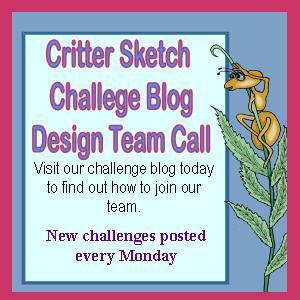 Would you like to be a part of our team over at Critter Sketch Challenge Blog? It's a fun DT with a great group of girls and bi-weekly challenges. Check out this post or email Melanie at melaniebitting@gmail.com for application information! I used one of Stamping Bella images "You're my Number one-abella". I thought it would be perfect and I've had the image forever and hadn't coloured it. I was able to use one of my new dies and a leftover flower I had in my flower drawer. All paper came from my Echo Park "Yours Truly" paper pad. 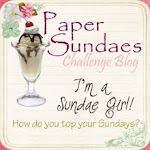 Be sure to check out the SOS Challenge Blog for some fabulous inspiration from the rest of the SOS girls! !